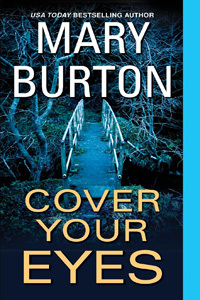 Cover Your Eyes by Mary Burton: Synopsis and Online Purchase Options. Synopsis (from the publisher): At first, they struggle to escape. Then a torrent of blows rains down upon their bodies until their eyes cloud over in final agony. The killer shows no remorse — just a twisted need to witness each victim's last terrified moments. Public defender Rachel Wainwright is struggling to reopen a decades-old case, convinced that the wrong man is in prison. Homicide detective Deke Morgan doesn't want to agree. But if Rachel's hunch is correct, whoever fatally bludgeoned young, beautiful Annie Dawson thirty years ago could be the source of a new string of brutal slayings.